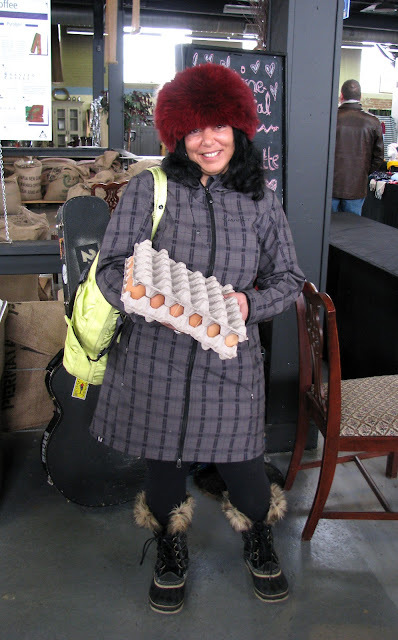 I almost called this post "Hat and Eggs", because I thought that since I shot the photo at the Farmer's Market, I should make the title food related, but the chance to be able to use "fluffy" again won out. Gina looked wonderful in her fabulous faux fur hat that she picked up a while ago at Winners (we love Winners!). The red is gorgeous against her dark hair, and gives her a modern "Doctor Zhivago" vibe paired with her sleek and subtlely plaid coat, and her fur trimmed Sorels. I've been ever so happy to see that Sorels have given the ubiquitous "UGG" strong competition for most popular winter boot for women this season. LOL. I always have and always will love that hat. I love that hat! I'm not sure if I could pull it off but I admire that she can!